Bumba II: From Zigala to Zemambiquo is a collaboration between artists from Santiago de Compostela and Maputo. 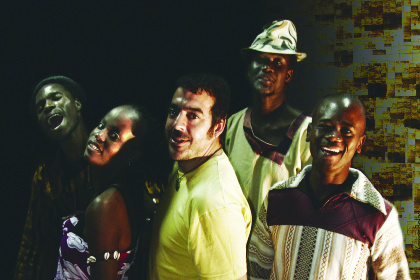 Fran ‘Narf’ Pérez is one of the leading musicians and songwriters of contemporary Galician music and Timbila Muzimba is a collective founded by a group of young Mozambican musicians and dancers in Maputo in 1997. Together they have been creating performances in Spain, Portugal and Mozambique for over ten years. The members of Timbila Muzimba belong to the Machopi ethnic group and the objective of the project has been to develop joint ideas about tradition and modernity and the preservation of cultural identity in a globalised world. To which it must be added that a Narf & Timbila Muzimba concert is a dynamic collision of Mozambican grooves, steaming funk-rock and intercontinental musicianship of the highest order.